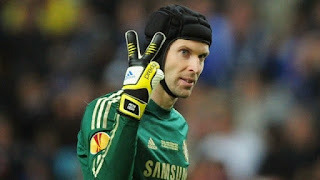 Arsenal are leading Paris Saint-Germain, Tottenham and Manchester United in the race to sign Petr Cech, according to the goalkeeper's coach at Chelsea. Arsene Wenger is growing increasingly confident of concluding a £11million deal to sign the Czech Republic shot-stopper this summer, though the Gunners face competition from Premier League rivals as well as other top European sides. But Cech's goalkeeping coach Cristophe Lollichon, who has worked with the 33-year-old for 10 years, has hinted that he wants to stay in England and has called Arsenal a 'top club with big ambitions'. PSG hold an interest in Cech, who struggled to get the better of Thibaut Courtois last season, while Spurs may be on the lookout for a new stopper should Hugo Lloris leave the club. 'His family like England. And a player is happy when his family is happy,' Lollichon said on French radio station RMC. 'The advantage is that Arsenal is a top club, with a philosophy that pleases him and that is at London. It is a base for consideration. Tottenham? I do not think they have the same ambitions as Arsenal. Petr wants to break a record of the clean sheets in the Premier League. Cech's decision could also come down to the Premier League clean sheet record, as he currently trails David James by four with 166 shut-outs during his 11-year stay at Stamford Bridge.